Robot built by fifth-graders. Photo taken by a 2017 student. Formative assessment, assessment for learning that occurs during a unit of instruction, is dynamic assessment. It gives teachers the opportunity to find out what students are able to do on their own or with adult help and guidance (Shepard, 2000). By making students’ thinking visible and open to examination, it can reveal what a student understands and what misconceptions they hold (Trumbull & Lash, 2013). It also provides opportunities for scaffolding steps between one activity and the next, for each individual student (Shepard, 2000). Guided by Rubric 3.0, my third iteration of a rubric to assess other assessments, I have created the first draft of a formative assessment. Formative Assessment Design Version 1.0 is meant to be used during a fifth-grade robotics module that I teach. During a typical school year, I teach this module four or five times, so I look forward to revising this formative assessment over time to make it the best it can be. Shepard, L. (2000). The role of assessment in a learning culture. Educational Researcher, 29(7), 4-14. According to Hattie and Timperley (2007), feedback, information a learner receives about aspects of their performance, can come from a variety of sources, such as a teacher, parent, classmate, book, or an experience. Feedback makes an impact when it helps to close “the gap between where students are and where they are aiming to be” (p. 90). Its impact on student learning can be significant, although some types of feedback have a greater positive effect than others. Among other additions, I gave special consideration to the impact of feedback as I created Rubric 3.0, the third iteration of my rubric by which to assess other assessments. Earlier iterations of this assessment rubric are Rubric 1.0 which you can read about in an earlier blog post, and Rubric 2.0 which you can read about in another earlier blog post. In the coming weeks, Rubric 3.0 will become Rubric 4.0. By then, it will include ten carefully selected criteria for judging assessment instruments. I look forward to learning more and sharing that rubric soon. Hattie, J., & Timperley, H. (2007). The power of feedback. Review of Educational Research, 77(1), 81–112. When I was a visual arts educator, a staple of art class was the art project: the kind that gets hung in the hallways and displayed at district-wide art shows. Typically, each unit included a culminating art project. They may have been 2-dimensional or 3-dimensional, digital or physical, and comprised of any of a variety of materials. I used this assessment genre for all my classes, kindergarten through high school. Even when I was a student in visual arts education classes, I made artwork for the same reason: so that my teachers could assess my understanding of the concepts we had been learning in class through my creation of artwork. Because of the importance of this assessment genre to art education, I decided to do a critical review of the art project genre for my latest assessment assignment. “To understand is to be able to wisely and effectively use—transfer— what we know, in context; to apply knowledge and skill effectively, in realistic tasks and settings” (Wiggins & McTighe, 2005, p. 7). An authentic performance task is one way to assesses students’ ability to transfer what they know (Wiggins & McTighe, 2005). It only makes sense, then, that one assignment in my Assessment class is to create a rubric by which to judge other assessment instruments. I began this assignment two weeks ago, with Rubric 1.0 which you can read about in an earlier blog post. In that first iteration, I identified three criteria for quality assessments: direct and specific feedback, transparent learning targets, and a self-assessment component. In this second iteration, Rubric 2.0, I added two criteria for quality assessments: the assessment requires only target knowledge, skills, and abilities (KSAs) to complete; and the assessment requires a transfer of knowledge to demonstrate understanding. One approach to creating valid and fair assessments is to require only target knowledge, skills, and abilities (KSAs) to complete the assessment. Assessment designers first identify what evidence is needed to judge whether students have demonstrated specified aspects of learning. After determining what knowledge, skills, and abilities (KSAs) are required, assessment designers then examine the assessment tasks to determine whether other unwanted, non-target KSAs are required to complete the assessment. If unwanted KSAs are included in the assessment, the assessment will yield results about the target KSAs and non-target KSAs, such as language skills or math skills (Trumbull & Lash, 2013). Therefore, non-target KSAs should be eliminated. As stated in the introduction, a well-crafted assessment that assesses students’ ability to transfer what they know should include an authentic performance task (Wiggins & McTighe, 2005). The assessment tool should clearly describe criteria for degrees of understanding. Understanding should be assessed separately from other traits, like mechanics, organization, and craftsmanship. According to Wiggins and McTighe (2005), those other traits should be assessed in a separate rubric, or all of the traits should be assessed in a grid-style rubric. Eventually, my Rubric 2.0 will become Rubric 3.0, and finally, Rubric 4.0. By then, it will include ten carefully selected criteria for judging assessment instruments. I look forward to learning more and sharing those rubrics in future posts. Assessment is an important topic in education, with teachers, administrators, parents, students, and policymakers all staking a claim to the results of various types of assessments (NWEA, 2015). Assessment can be used to inform teaching and provide feedback to students. When used effectively, it can “support and enhance learning” (Shepard, 2000, p. 4). Testing is just one form of assessment. Drawing by Sarah Van Loo, 2017. In an effort to improve my assessment practices, I critically examined one of my own assessments. First, I chose three elements that “make it possible for assessment to be used as part of the learning process” (Shepard, 2000, p. 10). Then I began drafting a rubric with which to assess other assessments, Rubric 1.0. As the name implies, this rubric is a work-in-progress. The word assessment can refer to both the instrument and the process (MAEA, n.d.). The assessment tool that I chose to examine is a rubric for a comic strip. The last time I used this assessment tool was a few years ago. Nevertheless, I created it using a format that I often use for middle school art rubrics, so I think it is useful to examine it. The assessment process was a project, the creation of a comic strip by each student in my middle school art class. The purpose of this assessment was to evaluate students’ understanding of craft, character development, story, and the basic elements of a comic strip, through their creation of a comic strip. When I created this assessment tool, I made the assumption that my students were able to read and interpret each of the criteria and descriptions. I also made the assumption that my students understood the vocabulary used in the assessment tool. Assessment doesn’t have to be a monster. Drawing by Sarah Van Loo, 2017. In examining my rubric, I assessed whether it met the three criteria I used to create Rubric 1.0: feedback to students is direct and specific, learning targets are transparent, and it includes a component of self-assessment by the student. According to Black and Wiliam (1998), feedback to students should be direct and specific, giving advice to students so they know what can be improved. This helps students recognize their own ability to improve. In my experience, students sometimes view themselves as “talented” or “not talented.” With specific feedback about their own performance, they develop a growth mindset and learn that they can improve regardless of where they started. The comments section of my assessment tool provides a space to provide specific feedback to students. If the teacher does not use the comments section but only circles the pre-written descriptions, students may view this feedback as vague. Students should have access to the criteria by which they will be graded, providing them with the opportunity to strive for excellence and the ability to see the “overarching rationale” of classroom teaching (Black & Wiliam, 1998, p. 143). I have noticed that when students have clear expectations laid out for them, it prevents a lot of questions from being asked. Students do not need to ask or guess what quality work looks like because clear guidelines have already been established. The comic strip rubric sets forth clear expectations for quality of work, quantity of work, and use of time in class. It is possible that more elements of a good comic strip could be added, but this rubric sets forth standards for excellent work, as well as work that could be improved. When students assess their own work, the criteria of the assignment and feedback from others becomes more important than the grade alone. Students who assess their own work usually become very honest about it and are prepared to defend their work with evidence (Shepard, 2000). Students who assess their own work are prepared to defend their work with evidence. When students assess their own work, they use what they discover to improve their own work. I have noticed that they iterate on their projects and make improvements, without prompting. The comic strip rubric allows for student self-assessment, providing one bonus point for doing it. In my experience, this provides an incentive for some students. Other students do not see the inherent value and therefore pass on assessing themselves. Rather than making it an optional bonus point, it could be a required element of the rubric. 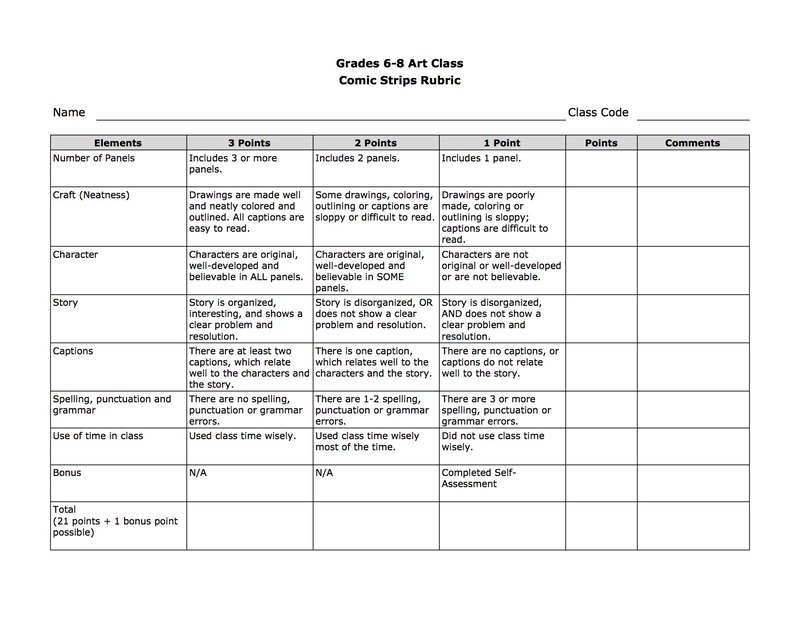 At this point, the comic strip rubric does include the elements of Rubric 1.0. As I revise Rubric 1.0, though, I expect to discover ways to improve my comic strip rubric. Black, P. & Wiliam, D. (1998). Inside the black box: Raising standards through classroom assessment. Phi Delta Kappan, 80(2), 139-144. As I prepared to do this, my final project for my three summer classes, I was stuck. These classes have been exhilarating, challenging, and rewarding. Sometimes there were tears, both frustrated and proud. Today I created something wonderful and hoped that the excitement from that would fuel me through this post. It didn’t. The hard part is that after so many weeks of pushing myself so hard, my brain was stuck. my objectives for the assignment was to apply Warren Berger’s Why, What If, and How questioning methodology from A More Beautiful Question (Berger, 2016) to my own practice. So I eventually, begrudgingly started with that. I began with creating a list of Why questions related to my teaching. I teach Project Lead The Way (PLTW) to students K-5 in two schools. I teach engineering concepts to all my students and coding to all my students except my kindergarteners. As soon as I started asking questions, my imagination took flight. As Frances Peavey once said, a good question is like “a lever used to pry open the stuck lid on a paint can,” (Berger, 2016, p. 15). That was it! I simply needed to start asking questions and I was unstuck, just like the lid of the paint can. Why do some students keep asking if they’re doing the problem “right”? Why do some of my students think they can’t code? Why do some of my students refuse to participate? As I considered my Why questions, I focused on the fact that “Integrating coding into classes is being perceived by many as a way to stimulate computational and creative thinking,” (Johnson, Becker, Estrada, Freeman, 2015, p.21). Therefore, I decided to address the question: Why do some of my students think they can’t code? The ScratchJr coding environment is user-friendly for young students, but still offers the opportunity to learn computational thinking. Pondering this question, I realized that my first and second-grade students have great confidence when it comes to coding. It is my third through fifth-grade students who are more likely to struggle. With my Why question in my mind, I began to ask What If. During this time of creative, wide open questioning, I asked What If questions to help me consider possibilities for change (Berger, 2016). What if I let my older students start with ScratchJr (typically only first and second graders use ScratchJr)? What if I made time for Hour of Code or other warm-up activities before starting on our unit together? What if I ran an after-school coding club? What if I work more closely with the media specialist to coordinate coding lessons? Asking How is about focusing on making progress toward a solution, about deciding which ideas to pursue (Berger, 2016). One of the great conundrums of my schedule is that I never seem to have enough time. How can I find time to let some students practice coding more outside of class? This practice could be with ScratchJr or with the app they’ll use during PLTW. It could even be a different app, as long as they get the opportunity to practice the computational thinking they need to improve their coding skills and gain confidence. Prior to completing this assignment, I had vaguely considered this issue in the past but hadn’t gotten much past that. By taking the time to do this questioning process, I feel like I’ve taken my first steps toward solving a complex problem in my practice. My next step will be to talk to my classroom teachers to figure out how we can work together on behalf of our students. Berger, W. (2016). A more beautiful question: The power of inquiry to spark breakthrough ideas. New York: Bloomsbury. Johnson, L., Becker, S. A., Estrada, V., & Freeman, A. (2015). NMC horizon report: 2015 K-12 edition. Austin, TX: The New Media Consortium. All images in this blog post were created by Sarah Van Loo. Since I was little, I have loved to draw. I enjoyed everything about it. I wanted to learn how to make animated movies but never did. Now as an art teacher and technology teacher, I have access to great technologies that can help me. In fact, I spent last year teaching K-5 students coding in ScratchJr, Hopscotch, and Tynker. This summer I decided to take what I already know about coding from those applications and do what I’ve always wanted to do: make an animated movie. I created this animation using Scratch. All images and videos in this blog post were created by Sarah Van Loo. Each year The New Media Consortium reports on key trends, significant challenges, and important developments in the field of educational technology. Among the significant challenges of 2015 was teaching complex thinking (Johnson, Becker, Estrada, & Freeman, 2015). The problem itself is complex enough that we could refer to it as a “wicked problem.” According to Koehler and Mishra, these are described as problems that “have incomplete, changing and contradictory requirements” (as cited in Week 4 – Learn, 2017). “Rodin’s The Thinker” by Andrew Horne, retrieved from https://commons.wikimedia.org/w/index.php?curid=15582363, is licensed under Public Domain. Because of the changing nature of wicked problems, it is impossible to come up with a perfect solution. Instead, my team Laura Allen, Guadalupe Bryan, Alex Gorton, and I worked to investigate and try to offer a “best bad idea” in response to the problem of teaching complex thinking (as cited in Week 4 – Learn, 2017). We approached this wicked problem from the perspective of A More Beautiful Question. We hoped to ask “an ambitious yet actionable question that can begin to shift the way we perceive or think about something – and that might serve as a catalyst for change” (Berger, 2016, p. 8). Although our problem is unsolvable, we can still be a catalyst for change – if we know what to do. Using the method presented in A More Beautiful Question, we asked Why, What If, and How. The most challenging aspect of this approach was giving time and thoughtful consideration to each phase in order to ask good questions. Berger points out that we’re deluged with answers, but “to get to our answers, we must formulate and work through the questions ourselves” (Berger, 2016, p. 3). How are teachers addressing the complex thinking skills necessary for students to become productive and innovative 21st-century learners? After arriving at our driving question, we responded by asking What If. When we ask What If, we use creative, divergent thinking to expand the possibilities to explore. What if students had more freedom/choice in developing their complex thinking skills? With our survey results in and our What If question settled on, we investigated current research around the question of How. We researched four current educational trends around student choice: project-based learning, genius hour, authentic inquiry, and student choice in assessments. Collaborative teamwork is a 21st-century skill that our group used to great effect. Even though we were never all in the same room for this, apps like Zoom, text messaging, Google Docs, and email helped us undertake this complex project. The process was challenging at times, but the results were worth it. I am excited to try out some of our suggestions in my own class this fall. Unless otherwise captioned, all images and videos in this blog post were created by Sarah Van Loo or the students of MAET Year 1. Today’s workforce requires graduates with 21st-century skills of collaboration, communication, creativity, and critical thinking, as well as entrepreneurship and innovation. These skills are needed in both the private and public sectors, but many of today’s graduates don’t have them (Jolly, 2016). Today’s graduates are not qualified to fill many tech positions in the public and private sectors. Hoping to solve this problem, a new movement focuses on educating students in science, technology, engineering, and math (STEM). Yet even with continuing unemployment, many tech companies are still unable to find graduates with the 21-century skills they need (Jolly, 2016). STEAM: Today’s Answer to STEM? We need innovators and creative thinkers to help transform our economy. In the 20th-century, that transformation came about through science and technology. In this century it’s art and design that are poised to help facilitate that change (“STEM to STEAM”, n.d.). This understanding has fostered the STEAM education movement, which adds art, design, and the humanities to the four STEM subjects (Johnson Becker, Estrada, & Freeman, 2015). Teachers and administrators face increasing pressure from policymakers to meet benchmarks in proficiency and growth. The result is more time spent practicing test taking skills and less time spent in student-centered, inquiry-driven lessons. This narrow-minded focus on testing leads to narrow-minded thinking. The result? “Young Americans are being educated out of creativity” (Pomeroy, 2012). We need creative students, though. Creativity is closely related to divergent thinking, the kind of right-brained thinking that leads to fresh ideas and new perspectives (Connor, Karmokar, & Whittington, 2015). When coupled with convergent thinking, the partnership produces the kind of innovation we are seeking (Maeda, 2012). Creativity, “the process of coming up with original ideas that have value,” is now “as important in education as literacy” (Robinson, 2006). Unfortunately, the hierarchy in education places math and languages in a position of importance above the arts. This hierarchy denies the importance of the disciplines coming together. Yet where the different disciplines come together, like in STEAM education, is where creativity flourishes (Robinson, 2006). Where Is STEAM’s Place if We’re Prepping for the Test? Research shows that students who have a background in arts do better on standardized tests (Johnson et al., 2015). They are also leaders in entrepreneurship and inventing. Michigan State University researchers studied a group of MSU Honors College graduates. Those with arts exposure were more likely graduate from a STEM program and to own businesses or patents (Lawton, Schweitzer, LaMore, Roraback, & Root-Bernstein, 2013). Artistic endeavors while young helped foster the kind of innovation that creates jobs and invigorates business. “So we better think about how we support artistic capacity, as well as science and math activity, so that we have these outcomes” (Lawton et al., 2013). My current position is that of a K-5 STEM educator. In my role, I teach Project Lead The Way, a national curriculum with the aim of helping students learn 21st-century skills. Last year, my kindergarteners learned about pushes and pulls. Their final project was to design and build a model that would move some blocks up a ramp. When I taught this unit at my first school during the first half of the year my students were successful. They all met the design challenge. Before I taught at my second school, though, I had some time for reflection. I made a few simple additions to my supplies for building day. I brought along some feathers, pipe cleaners, pom poms, and cutoffs from cardboard tubes. I did not tell the students what they were to be used for and the design criteria remained the same: they were to build a model that could push or pull the blocks up the ramp. I feel privileged to be at the beautiful intersection of two STEAM disciplines. Trained as a Visual Arts Educator and earning a master’s in educational technology, I am in a position to infuse art into any STEM lesson that I can. If I am ever back in an art room, my goal will be to put technology into the hands of my art students. Either way, I look forward to educating tomorrow’s creative world changers. When I considered the ideas of TheThirdTeacher+ (O’Donnell, Wicklund, Pigozzi, Anderson, & Mau, 2010) and how I could apply them to redesigning my classroom for 21st-century learners, I found the challenge exciting. Using the questioning technique (Why? What If? How?) from A More Beautiful Question allowed me to consider the design challenge from various perspectives (Berger, 2016). In my current teaching position, I teach K-5 STEAM curriculum in two elementary schools and travel with my teaching materials on carts. Since I don’t have a classroom of my own to redesign, I imagined a typical classroom space in one of my two schools. I chose a 25’ x 35’ rectangular space with one door and two large windows with a large closet for storage and tools. More than one classroom in both schools featured old, heavy, rectangular desks in rows. That kind of classroom arrangement began as far back as the Civil War and continued to thrive as factory workers were educated in the early 1900s (Stoll Dalton, 1998). That kind of classroom was what I envisioned as a took on the redesign challenge. My goal in redesigning my classroom is to create a context for educating students in 21st-century skills. These include communication, collaboration, systems thinking, creativity, and analytical habits (Long, 2012). This classroom has spaces for students to work individually, in small or large groups, at tables, standing, or in comfortable spaces. By facing each other instead of the front of the room, I am creating a space that is student-centered. The Third Teacher proposes 79 Ways You Can Use Design to Transform Teaching + Learning (O’Donnell et al., 2010). Using many of these design suggestions, I considered how the space could be restructured and improved. This space reflects current mindsets about learning. In my classroom, I “make peace with fidgeting” (#20) by incorporating VS chairs that are designed to allow students to rock slightly, sit in the chair backward, and even sit on the backs of the chairs. It “cherishes children’s spaces” (#3) with large rugs and beanbags and a space with a couch and soft chairs (O’Donnell et al., 2010). Soft spaces are inviting for children and promote collaboration. My design “makes classrooms agile” (#23) by incorporating wheeled tables and whiteboards that allow the spaces to be easily reconfigured for multiple purposes. It is “designed for speech and hearing” (#8) by including sound-absorbent rugs and soft furniture, as well as a sound field. With this device in the room, the teacher can speak in an even tone and all students can still hear well. The space “supports great teachers” (#12) by removing the teacher desk. The teaching equipment is mobile, allowing the teacher to support students where they are (O’Donnell et al., 2010). A mobile teaching center allows the teacher to move around the classroom. How Will We Redesign The Learning Space? I illustrated my reimagined learning space including rolling tables, child-friendly chairs, and multiple spaces for small groups. I included plants, lamps, modern educational technologies, lots of storage space, and great maker tools (a laser cutter, 3D printer, and vinyl cutter). Rolling tables and whiteboard allow the classroom to be easily reconfigured. Stand up desks allow an alternative to sitting at tables. The decisions I made in my design were partly limited by the availability in SketchUp’s 3D Warehouse. For example, VS makes wheeled tables with rounded corners that can be reconfigured in myriad ways. These tables were not available in the warehouse, so I opted to use rectangular tables that do not have the same range of options for arranging them. According to Experience Design, students’ experience includes their participation in the room and with each other. It also entails emotion so it’s important to consider how they will feel in the space (van Gelderen, 2010). A cafe table is a fun space for students to collaborate with each other or meet with the teacher. My design allows us to “open the doors” (#60), “display learning” (#15), and “emulate museums” (#16). These all involve displaying student’s work as though the classroom were a gallery space. I included multiple open shelving units and blank walls (O’Donnell et al., 2010). I would know if the classroom redesign met students’ needs in several ways: Are students using the space more collaboratively? Are they independently using the unique resources of the room, such as the laser cutter? Have they taken ownership over the classroom gallery of student work? The space itself can only go so far: I have to use it wisely. As a teacher, I must make the choice to use different spaces differently (#10), allow students to have a choice about what they want to do (#14), and allow for uniting art and science (#18) (O’Donnell et al., 2010). Long, C. (2012). Teach your students to fail better with design thinking. Learning & Leading with Technology,16-20. Retrieved from https://static1.squarespace.com/static/509c0d15e4b058edb8f35a86/t/50f49750e4b0c7661ad2efc5/1358206800803/FailBetter_DesignThinking ISTE article.pdf. All images in this blog post were created by Sarah Van Loo using SketchUp. This summer I made something that I am really proud of! I illuminated a tutu with a LilyPad Arduino using only online resources. I was challenged to set aside traditional learning resources, which I wrote about in an earlier post. In a previous post on this topic, I wrote about my lack of experience with this platform. I also wrote about switching between Uno and LilyPad. After I got my Uno controlling a series of LEDs on a breadboard, my next step was to code the Uno to control four NeoPixel LEDs. I installed the NeoPixel library in the Arduino IDE. I coded a simple sketch to illuminate the NeoPixels. Then I pulled in an example sketch from the NeoPixel library. The steps in coding are: write the sketch, verify it, then upload it. In my experience coding, if error messages come back at either the verify or upload stage, the sketch will not work. I got a message when I attempted to upload my sketch that said, “User configuration file does not exist or is not a regular file, skipping.” In RED. That was one of approximately 60 lines in the error message. So I researched. For hours, I read Internet help forums in which other Arduino Makers had reported the same error. From what I could find, it appeared that my version of Mac OS was not going to work with Arduino. I began to envision having to scrap this project and start over. I spent at least four hours reading and uninstalling and reinstalling the Arduino IDE. I even opened the Mac Terminal and considered manually inputting some instructions directly into the command line. Then it happened. After hours of reading and more than a few tears shed, I found it. On the Arduino Product Forum, someone had written, “Don’t worry, it’s not an issue to have this message – it will use the supplied default. :)” The smiley face was really included in the forum post. I am sure I had read this message ten times. This time, though, I realized what it meant: my code would work, in spite of the error message. I tried one more time and it worked! My troubles weren’t over, however. When I tried to switch from the Uno to the LilyPad, I discovered that my LilyPad had gotten broken so I ordered a new one. Once it arrived, I was finally able to switch from the Uno to the LilyPad and got my LilyPad to light up the NeoPixels. Next, I connected all the NeoPixels to the LilyPad using wire and electrical tape. It would have been more elegant to use conductive thread but I made this choice in the interest of time. Finally, I moved the LilyPad to battery power. I attached my daisy-chained NeoPixels and the LilyPad to the tutu. The results were lovely, and I was delighted. As Jaymes Dec, teacher and Innovation Specialist says of digital tools, including Arduino, “I really want my students to lose their fear of failure,” (Burker, 2015, Loc 1731). I can attest to the fact that I truly thought I was about to fail during this project. In the end, I succeeded. I made something I didn’t know I could make and I learned a lot about microprocessors and myself in the process. Through persistence, I can figure out just about anything. And when something is so difficult that it hurts, overcoming is the sweetest success! This is the third of three posts about learning to code the Arduino. You can read about my decision to make this project in my first post. You can read an update about my early progress in my second post. Sometimes students come across our path who are late to class, missing materials, and disorganized. They cannot seem to plan their assignments and they turn their work in late. These experiences can be frustrating to teachers, but it is important to remember that they can be frustrating to the students, too! There is a cause for these behaviors. In some cases, the cause is executive functioning (EF) issues. Executive functioning is defined as “the mental processes that serve a supervisory role in thinking and behavior. It incorporates a number of neurologically based operations that work together to direct and coordinate our efforts to achieve a goal.” (Cooper-Kahn & Foster, 2013, p. 7). Executive functioning includes eight core executive skills, one of which is planning and organization (Goia, Isquith, Guy, & Kenworthy, 2000). Students with Autism Spectrum Disorder (ASD) and nonverbal learning disability (NLD) can be significantly impacted in the skill of planning and organization (Semrud-Clikeman, Fine, & Bedsoe, 2013). Planning and organization is “the ability to impose order on thoughts, tasks, play, and storage spaces,” (Cooper-Kahn, & Foster, 2013, p. 10). Students with poor planning and organization skills have difficulty breaking larger goals into smaller tasks. They also struggle to organize thoughts into a hierarchy. Their brain has a figurative filing cabinet, but they “just open the drawers and throw things in,” (p. 10). Organization of physical papers can be just as challenging. A person with planning and organization difficulties may just open the drawer and throw the papers in there. Consider your student who has a disorganized backpack with everything dumped into the main compartment. Call to mind the student who cannot remember to sign up to give a speech in class, despite your many reminders. Think about the student who rattles off information that doesn’t seem to you to connect to anything else that has been said in class. Those students may have issues with planning and organization. Digital technologies now permeate most areas of our lives. They are readily available at school and at home. We only need to look around at parks, restaurants, and grocery stores to see how widely available they are. Used wisely, technology can be a tool for helping students with learning needs including planning and organization. Students can learn skills and techniques for planning through digital games like strategy games, simulation games, and role-playing games. In these games, they learn skills such as predicting game events and switching between short- and long-term goals. They learn to prepare for an event by stocking up items in inventory, and they learn from their mistakes (Kulman, 2014). Games like Minecraft, Scratch, and LittleBIGPlanet help to support planning skills through fun and interactive means. Students need “foresight, planning, dividing the plan into steps, and then actually producing the work,” (Kulman, 2014, p. 118) to be successful. In addition to games, there are apps that can be both fun and helpful for students who need support with planning and organization. There is a direct application in the school setting as these tools can support students with the business of doing school. Students learn planning skills through apps when they use productivity tools to set and prioritize goals and when they search through digital content using keywords (Kulman, 2014). Two apps that support those skills are Evernote and Wunderlist. They are both powerful apps and are both on my list of regularly used tech tools for school. Either one could provide substantial support for a student. Used together, they can help students plan and prioritize commitments and organize and archive information. Evernote provides the ability to capture lists, notes, photographs, drawings, and websites. Evernote also has excellent capabilities for archiving information. Because it is searchable, anything that is archived in Evernote can be found again. Wunderlist is also a powerful list-making tool. The beauty of Wunderlist is that it is possible to prioritize list items with due dates, and to include subitems for each list item. Also, Wunderlist can push notifications to the students, so students who have a difficult time remembering to check a list will be automatically reminded. With both tools, students are able to make notes and write lists in advance of a project due date. Both tools allow sharing of notes or lists with others. Both tools are available online and as a download to the student’s device. If a student discovers that an Evernote checklist would make more sense as a Wunderlist, it is easy to use Evernote Integration via Task Clone to move that list from one app to the other. Cooper-Kahn, J., & Foster, M. (2013). Boosting executive skills in the classroom: A practical guide for educators. San Francisco, CA: Jossey-Bass. Kulman, R. (2014). Playing smarter in a digital world: A guide to choosing and using popular video games and apps to improve executive functioning in children and teens. Plantation FL, FL: Specialty Press, Inc. Unless otherwise captioned, all images and videos in this blog post were created by Sarah Van Loo. One foundational project in middle school art class is the creation of self-portraits. Through the creation of self-portraits, students develop several important artistic skills. They practice the skill of portrait drawing, and they practice making aesthetic choices to communicate meaning. Unfortunately, some students are self-conscious about drawing or about spending time looking in the mirror. They may be intimidated by the prospect of creating a pencil and paper drawing over the course of many days. They may be nervous about having to add shading and other details. The good news is that we don’t have to give in to the pressure from some of our students not to do self-portraits at all. In fact, we can keep both the art content and our pedagogy intact. Instead of having students create their self-portraits with paper and pencil, we can have them create using a digital tool like Autodesk SketchBook for the iPad. Why Use New Technology for an Old Art Problem? We can find a sweet spot in teaching when we combine our content knowledge (CK), our pedagogical knowledge (PK), and our technological knowledge (TK), referred to as The TPACK Framework (Mishra & Koehler, 2009). In this case, our content knowledge is the knowledge of how to create a self-portrait. Our pedagogical knowledge involves when to model drawing and when to give time for inquiry and exploration. This work, “TPACK Framework in Digital Self-Portraits”, is a derivative of TPACK by Koehler (2012), used under CC0 1.0. “TPACK Framework in Digital Self-Portraits” is licensed under CC0 1.0 by Sarah Van Loo. In my digital self-portrait example above, I took a different approach to creating a self-portrait than I normally would have. Typically, I would have started by making a line drawing with charcoal or a pencil. I probably would have added some shading, and then I would have been finished. In my digital self-portrait, instead of focusing on drawing lines, I focused on adding colors, shadows, and highlights. I also used a variety of digital tools, including the airbrush, technical pen, pencil, and watercolor. Having these tools available digitally meant that they were readily available and easy to access; by contrast, using all of these tools in a traditional setting would be cumbersome and time-consuming. When students are given the opportunity to create digitally, those who may have been hesitant to start drawing will feel like they are at play because of the freedom provided by a wider range of tools. When students enjoy what they are doing, they are more likely to become lifelong artists. Mishra, P., & Koehler, M. (May 2009). Too cool for school? No way! ISTE (International Society for Technology in Education), 14-18. Featured image: DevilsApricot (Artist). (2016). Art Supplies, Brushes, Rulers [Digital Image]. Retrieved from Pixabay website: https://pixabay.com/en/art-supplies-brushes-rulers-1324034/. Licensed by CC0 1.0. Digital self-portrait was created by Sarah Van Loo. Koehler, M. (Artist). (2012). Derivative of TPACK [Digital Image]. Retrieved from Wikimedia Commons website: https://commons.wikimedia.org/wiki/File:TPACK-new.png. Licensed by CC0 1.0. “TPACK Framework in Digital Self-Portraits” is licensed under CC0 1.0 by Sarah Van Loo. Sarah Van Loo’s Blog by Sarah Van Loo is licensed under a Creative Commons Attribution-NonCommercial-ShareAlike 4.0 International License. Based on a work at www.sarahvanloo.com.